The 19th October 2018 was a crisp autumn morning here in Batley, West Yorkshire, and there was a definite feeling of excitement in the air. Comfort House had been meticulously tidied, cleaned and redecorated in anticipation for our very special visitor. 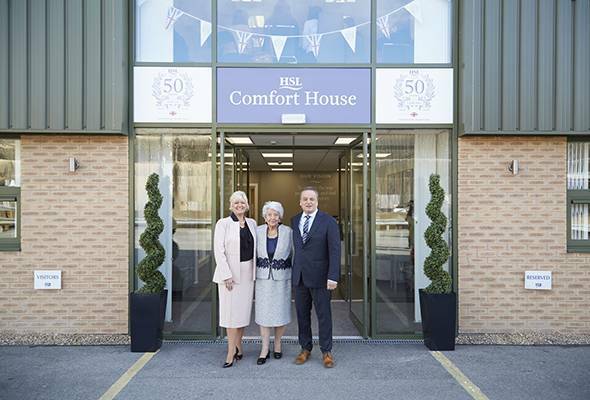 There was a constant stream of people arriving: more than 60 store colleagues from all over the country, Regional Managers, Trainers, and family members – including Mrs Burrows, who along with her husband, started HSL back in 1968. There were even a few lucky customers who had been specially selected and invited along to the day, as well as some transatlantic guests who had flown in especially for the event. At 11.45am a sleek 4×4 pulled up outside and, thanks to months of preparation and hard work from so many different people within the business, and as a celebration of our 50th anniversary, out stepped Her Royal Highness, The Princess Royal. 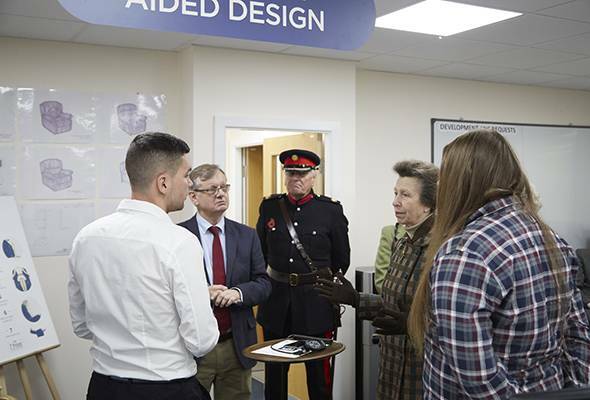 Princess Anne first met with Mrs Burrows, business owners William, and Debra Burrows, and our CEO Guy Critchlow, before being taken into Comfort House itself. On meeting Diane, our warm and welcoming receptionist, HRH commented kindly that her role was integral to a company like ours, and that without a friendly welcome, people were unlikely to return! 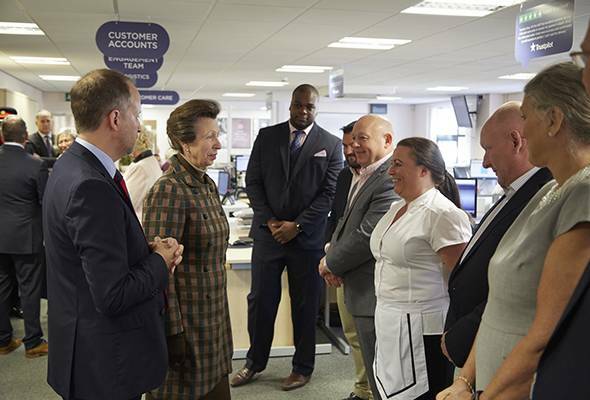 HRH was then taken on a detailed tour of our Customer Care department where Guy explained about all of the different types of calls that we might expect on a daily basis. She spoke to a number of people within the business, from the Head of People Support to our Coffee Shop Manager. The Princess Royal was very friendly and courteous to everyone she met and took the time to speak with every individual she was introduced to. After her visit to Customer Care, our Manufacturing Director, Kevin Wall, took over the tour in order to demonstrate how our beautifully hand-crafted furniture is designed and built with CleverComfort™. 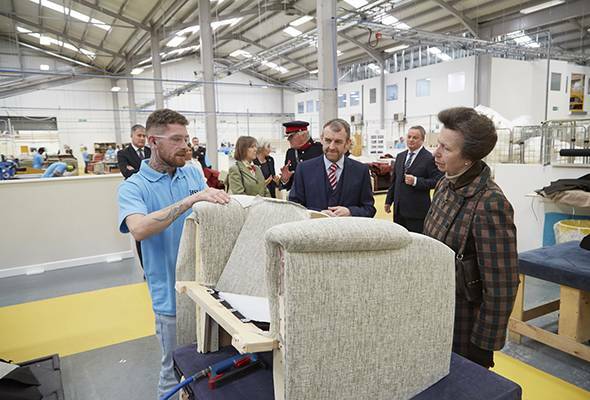 HRH was introduced to all of the departments that are involved in the design and manufacturing process of our chairs, sofas and beds, engaging with proud craftsmen & women, many of whom have been with our business for a long period of time. Princess Anne listened with great interest and looked genuinely fascinated to see each step of the process. She was friendly and warm throughout, making people feel at ease and even sharing a joke or two. Training and visual merchandising were next on the tour. The Princess Royal met our independent Occupational Therapist, Julie Jennings Dip COT HCPC and was shown how we ensure that all of our Comfort Specialists are trained to understand the importance of posture. As the Patron of the Royal College of Occupational Therapists, Princess Anne has a great passion for the subject, so had a personal interest in this particular part of the tour. She was shown our unique training process and how our Comfort Specialists take every customer through a personalised 7 Point Seating Assessment™ to ensure they find the chair or sofa most suited to their needs and size. The final stop was an opportunity for all our colleagues in the business to gather together for a special presentation. 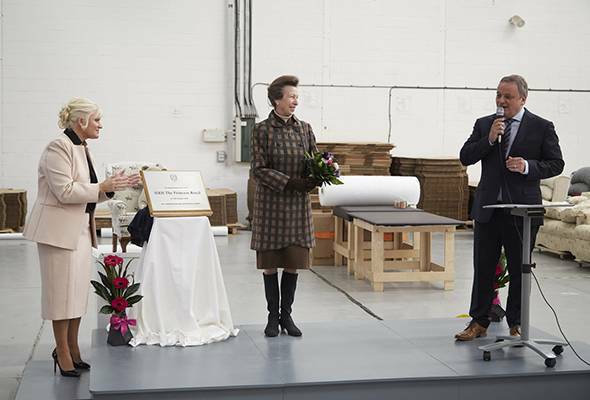 William gave a speech on how proud we are of our business and what an absolute honour it was to have The Princess Royal with us. 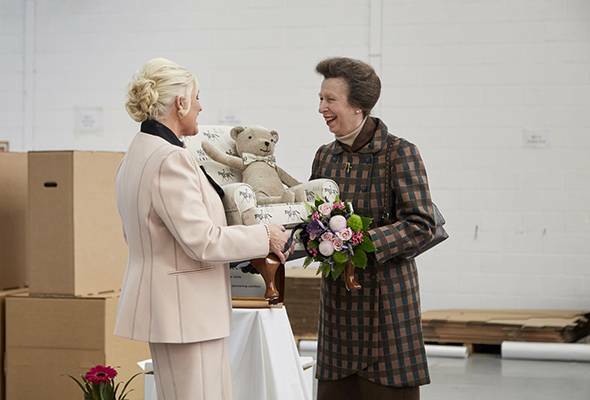 She unveiled an engraved plaque, and was presented with a gift of a child size chair and custom made HSL teddy bear – perhaps, as William suggested, to pass on to her grandchildren. 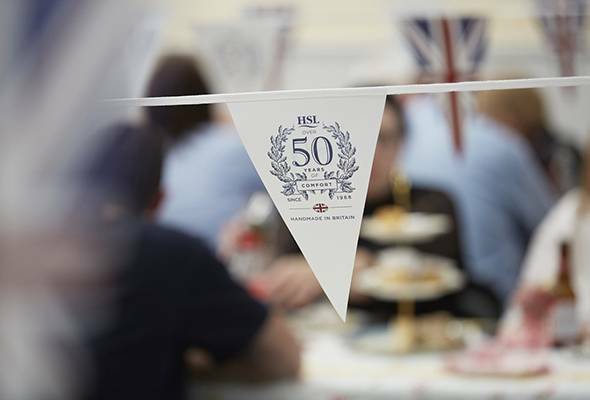 An amazing day was had by all and for the icing on the cake, our HSL colleagues and visitors enjoyed a very royal tea party. We would like to thank all of the people who were involved in planning this momentous occasion, and again, would like to reiterate what a great honour it was to have our Royal visitor here to celebrate 50 years as an HSL family.